Get Ready For Old Man Winter! It’s getting colder outside, its starting to get dark sooner and your air conditioner doesn’t kick on, are signs that good old winter is coming! We may not like it but as a landlord, we must protect our assets so they will remain profitable assets for years to come. 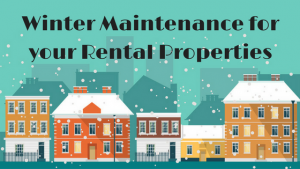 Our guidelines will help you perform the needed maintenance to protect your rental properties from the cold, wet, wind and ice of the season. Completing these tasks will save you time and money from costly damage during the winter months. Checkout their blog on how to do just that….get your rentals ready for winter.